Mom was just 20 and Dad only a few years older. As I personally went through some crisis situations when my parents were away from home and unavailable, I came to realize that this had been the same for them. Dad was not close to his parents and Mom’s parents were away on a trip when she went into labor at 25 weeks with her first baby. This was also 1952, when there were no NICUs which could save such preemies. Doctors then were seen as gods and not questioned, especially by young, unknowledgeable parents. So as Mom went into premature labor and rushed to the hospital, she was placed under anesthesia and the baby was delivered. He was quickly taken away, probably to a nursery. I have wondered if anyone there cared for him for the twenty minutes that he lived. Did a nurse clean him, wrap him in a blanket, and hold him? Or was he just set somewhere until he passed away? I do know that Mom never saw or held her first baby. She was just told later after she woke up. The hospital apparently “offered” to take care of disposing of the body, sparing them the expense of burial, since they had little money. So this baby that Mom carried for six months, feeling him grow and move inside her, simply disappeared and she was expected to get on with her life. She was young and certainly would have more babies. I suspect medical staff even thought they were being compassionate. Mom’s life did go on and she gave birth to five more children, all of which she was able to raise to adulthood. I have wondered how much this event influenced her as a mother. If she had not experienced this loss, would she have been more affectionate with us? Would she have been more spontaneous and playful? Would she have been less concerned with having her home and external life always in perfect order? Would she have felt less pain – physical as well as emotional – that needed numbing chemically? It was Dad who finally gave this baby a name some decades after his birth. He choose Etienne – the French version of Stephen. Finally he was given a place on family history records. 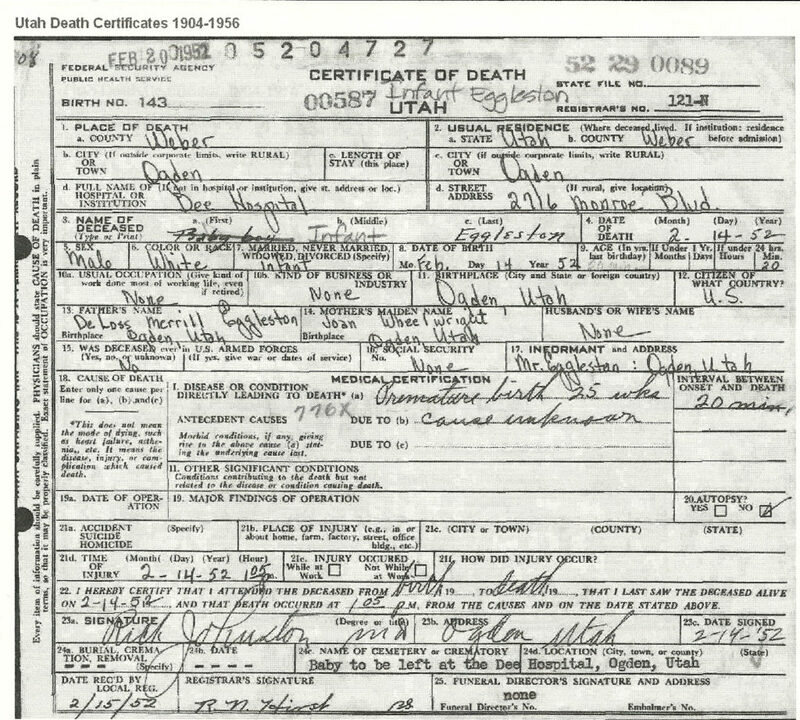 When records became available online, I found the only written document which confirms that he actually did exist – the single remaining trace of his brief life on this earth – a death certificate. 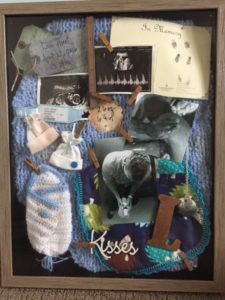 My youngest sister experienced the loss of a baby at 21 weeks in February 2000. I couldn’t help but notice how different her experience was from Mom’s. This tiny girl was bathed, cuddled, talked to and loved for almost three hours by her parents and older siblings. She was weighed at 9 oz. and measured to be 9 ½ inches. She was given a name – Emily Ann. 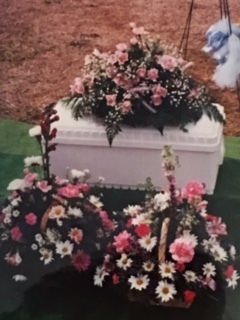 After her passing, she was carefully dressed in a beautiful dress and bonnet made by a family friend, and placed in a tiny casket. She was buried after a short service with touching songs and a spiritual message of comfort and support. My sister was living in another state at this time. I rushed there as soon as I could and our parents arrived the day of the service. Mom was not totally present and not giving her daughter the support I felt she needed. There have been few times when I have said things that made my Mom cry and really hurt her feelings. This was one of them. I was angry. Her baby daughter was suffering and she was not there emotionally for her. She seemed to have the attitude that they were making too big of a fuss. One of the things I remember saying was “Of all people, you should understand what she is going through.” Some time later I came to understand that she probably did not. I realized that for Mom to recognize her daughter’s grief, she had to also acknowledge her own grief- something she had not been allowed to experience at the time, and had suppressed for most of her adult life. How could she acknowledge the kindnesses and comfort others gave to her daughter, when she had not received any herself. She was too guarded to let down and feel the pain. She just continued to medicate it until she passed away later that year. This past spring our family buried another baby. This one was my grandson, who did not even take a breath in this world, but whose tiny body was treated with great respect and tenderness. Several traces remain of his brief existence here – a stone in the cemetery which bears the name he was given, photographs, a hospital bracelet, tiny clothes, a burp cloth “blanket” I made for him, plaster casts of his tiny hands and feet. He will not be forgotten. The 17th Birthday of Emily occurred this past week and she was remembered by family and friends. As we acknowledge the 65th Birthday of my older brother Etienne this Valentine’s Day, I want him to know that he is not forgotten. He is part of our family, joined by Mom, Emily, Levi and others on the other side. I look forward to enjoying a relationship with him, and all of them, for eternity. This entry was posted in Family heirlooms, My Stories of Discovery and tagged Eggleston, Utah. Bookmark the permalink. Happy Birthday Louise. I am grateful for your life too. I had the same physician who cared for your mother, and a similar experience, too private to share here. The physician had been my father’s mission companion and recognized that when he saw my maiden name on his forms. 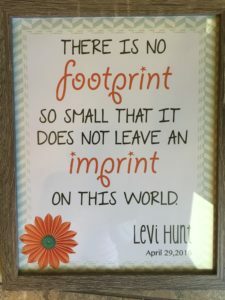 Sorry to learn of Levi’s short life. Such a touching post. I can’t imagine a more heartbreaking experience than to lose a little one. Thank you for sharing.